Hasselblad made a large polaroid back for the 500 series to help photographers check their metering and lighting before exposing film. I’ve played around with one a bit, but the back is pretty bulky, the film is expensive, and the film area is larger than the camera can expose. You’re left with an off-center exposure. If you’re going to try taking apart any sort of camera, be careful of the flash capacitor. It stores enough energy to give you a good zap. You can discharge it by shorting the two contact points closest to the capacitor — just make sure you’re holding a non-conductive handle. One of our biggest challenges was making a custom mounting plate that matched the back of the Hasselblad to the FujiFilm and didn’t leak light. We made a template based on the Hasselblad and laser cut matching groves into a piece of acrylic. Our solution works OK — light still leaks in direct sunlight. We’ll keep telling ourselves that this adds to the charm. 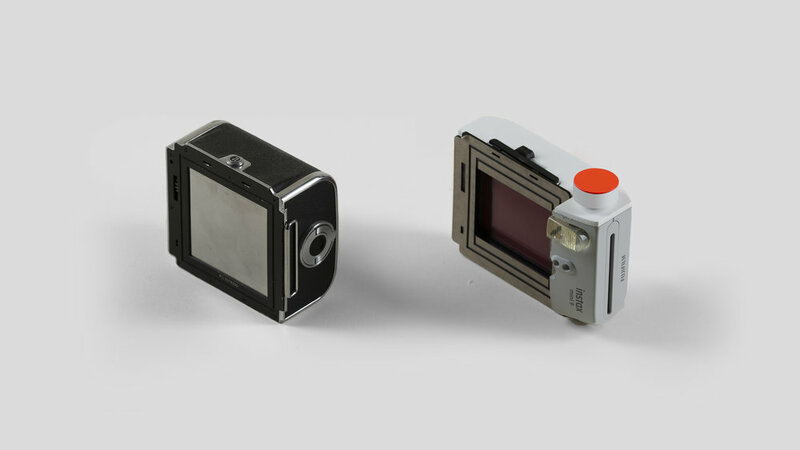 And here’s a side-by-side comparison of a standard Hasselblad film back and our instant back. We were really happy with our first tests. The full frame of the film is exposed and the images are sharper than we’ve ever seen on this type of film. There are still a few on-going issues with light leaks and with focusing because of the slight difference in focal plane length. Working under a time constraint proved to be extremely helpful not only to keep us accountable, but also to keep us from over-thinking the design. We tried not to lose the distinct form languages of each camera, to create an object that felt like 1950’s Swedish design and 1990’s Japanese design fused together. I’m looking forward to running around the city with this strange franken-camera — check back for more photos soon.